Let's get to the heart of a classroom library... the books. You can have the most inviting arrangement and streamlined organization, but without enough good books, it's all just a pretty facade, isn't it? But we all have to start somewhere, so let me share with you how I've stocked my classroom library and some of my thinking behind it. Whoa, was that a typo? No, but let me explain what I mean. For a beginning teacher, especially one on a tight budget, it can be stressful to know how you want to set up your classroom library but without the sheer number of books needed to stock it. I've been there. And there is no shame in having some "filler books." Imagine a sliding scale of quality when it comes to a children's book. Let's think of a "1" like a nonfiction book written in 1998 about the world wide web; and we'll think of a "10" like a just-released, last-in-the-trilogy book from a favorite author. Now, a first year teacher probably needs to accept books as low as a 3, maybe a 2 if she/he is really low on books. But after a couple of years, let's raise our standard to a 5, and when we feel like we have an established library, maybe a book needs to be like a 7 for us to buy it, and all of a sudden, quantity has taken a back seat to quality. And all is right with the world again. So don't be afraid to grab anything and everything you can in order to get your library started. And as I add new books and "sow" in new collections of authors and series and topics, my library's standard of quality and relevancy rises. I build up my series, author, and award winner collections by the STACK. This isn't always easy, but whenever possible, I load up on these books. These are the types of books that I already know we like and I can bank on being of high quality because of past experience with the categories. I build up my picture book, (noncategorized) chapter book, and nonfiction book collections with SINGLES. This wasn't always the case. If someone set up a table right outside my classroom with a thousand books on it, I used to peek in both directions, and then hoard as much as I could carry. But now-a-days, I try to be a little choosier and pick out just the gems. I really try hard to find high-quality nonfiction books, especially ones with lots of photographs, text features, and engaging text. I now know that these special books are almost never a dime-a-dozen, so I pick one up whenever I can. What follows is a list of my book sources, with some fun (and sometimes informative) notes. Just to put it out there, I'm not getting paid to mention anyone or anything here. Using Scholastic book orders is like extreme couponing. I rack up bonus points from my student purchases, especially during the back-to-school months when the points are doubled or tripled. I look for the "Spend $20, Get $10 free" monthly coupons and the random "100 free bonus points" coupons, too. It takes a little time to get the most bang for your buck (bad choice of expression here because you may not even have to spend a real buck) but it can be worth it for how many books you can get. I've been doing the online parent ordering for a couple of years now, which makes the whole process quite a bit easier for me and for the parents. I love Half-Price Books. The two stores that I've shopped at have huge children's sections, as well as a $1-and-under bookcase, which if you're willing to hunt through, you can always find a stack of books. Last year, my wife, who teaches first grade, and I were both up for the hunt. Unfortunately, our three daughters were not. After a few stares from other shoppers, repeated whisper-scolding, and several "just-hold-on-for-two-more-minutes-girls," we checked out with a shorter stack than normal. I live near a pretty huge public library. They have a book sale each fall and spring where they clear out part of their stock. It is AWESOME. First of all, the books are the library-bound editions, so they last a long time (even the ones that are being sold because of damage usually aren't too bad). And second of all, the books are cheap. There are two best times to go to a library sale: at the beginning and at the end. At ours, you want to go at the beginning to have the best selection and to scout. The prices are good (but I know they're going to get even better the second day) so I'll buy a few must-haves and then come back towards the end of the sale because that's when the closeout deals really happen. It's usually like a "Fill Your Bag for $5" kind of thing. You've never seen a bag crammed so tight with books as mine. Did you know Goodwill has a book section? Their children's book section can be a goldmine for teachers. At the store near us, paperbacks are 69 cents each, and if I go on the first Saturday of the month, everything in the store is half price, so we're talking THREE books for a BUCK, people! Make good use of your time and wait for the neighborhood sales. And then bring the van because you can really haul it in. It depends on the seller, of course, but I find garage sale books at 25 cents and even 10 cents a pop. And when you show the healthy stack of books to the lady in the lawn chair, don't be afraid to ask for some sort of bulk discount. Remember, they want to get rid of this stuff. Abe Books: What's nice here is that you can sort your search results by "lowest total price," so you don't have to worry about hidden shipping fees. My searches for a sampling of picture books and chapter books seemed to average between $3.00 and $3.50 per book. Thrift Books: Prices here start at $2.99 (but most books seem to be between $3.00 and $4.00). Free shipping within the U.S., and you get 50 cents off the additional books you buy from the same individual seller. Ask any seasoned teacher who a new teacher should become friends with at school, and the third place answer, coming right after the custodian and the secretary, is the school librarian. Mine, who just retired at the end of last year, is an enormous wealth of book-knowledge, and stayed very much "on trend" with books for our library, which in turn worked out well for us teachers (Do you see where I'm heading with this?) when she would roll the "free books" cart down to the work room, loaded with the books she's getting rid of in order to make room for her new ones. I'll take a good librarian's leftovers any day. This is also the best source for magazines. Yes, they are prior-year issues, but that doesn't bother me a bit. My librarian probably didn't know this, but some of my walk-throughs into the library's "back room" were to say hello, yes, but also to keep an eye out for that "free books" cart being loaded up so I could get first dibs. I don't do this every year, and it may or may not be appropriate for the population of students you have, but it can be fun to request (in an "optional" sort of way) families to donate a book to the classroom library. I like to allow the students to share with the class the title of the book being donated and why our class would like it. I then like to put a label inside the book that tells who gave it to our library. (Click HERE for a copy of the labels you see below.) And don't be surprised if some students (especially the "youngest-child" students) bring in a whole bag of books. 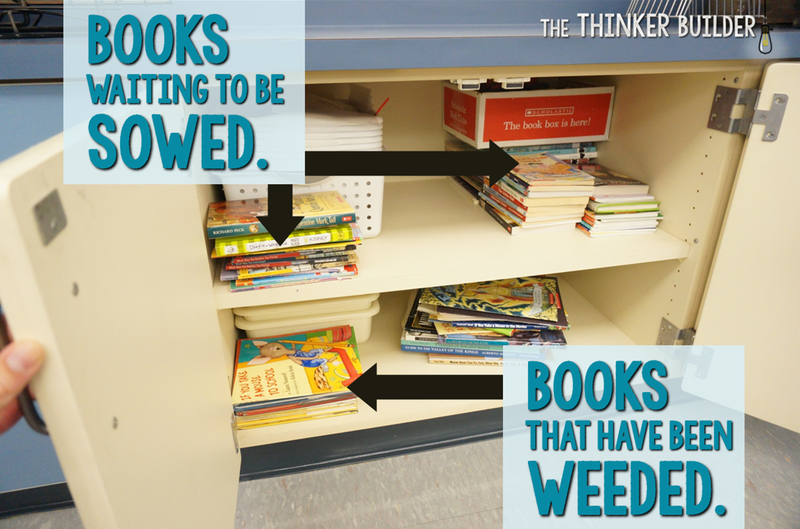 In a way, you are the middleman between the book sources and your students' hands. For me, it's not a job that ends. I'm always jotting down specific topics my current students are interested in, or a new series a child brings in from home. I'm paying attention to who writes the really good books I read aloud, and am on the lookout for more of those authors' books. I'm keeping my eyes peeled for engaging, high-interest nonfiction books, and I'm constantly building personal little wishlists for my next bonus point redemption. I'm trying to keep from having a static collection that only accumulates dust. Instead, by always looking for the next book, I'm shooting for a dynamic collection that accumulates readers. 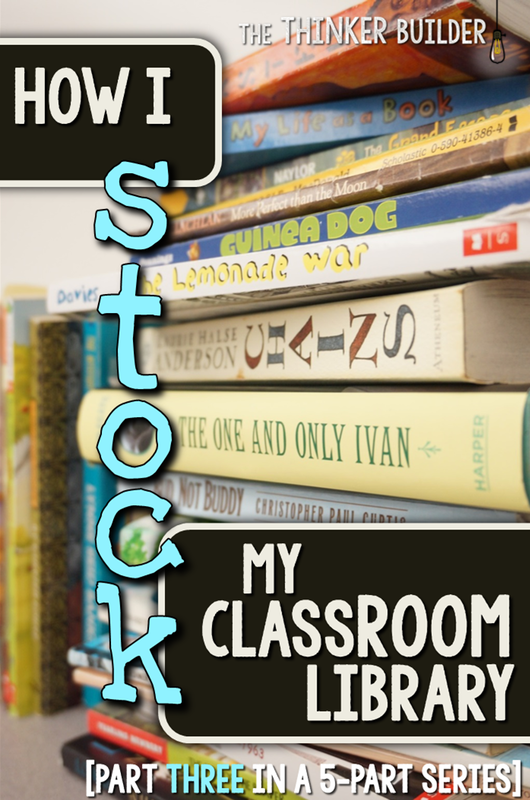 I hope you're looking forward to the fourth part in the series, where I'll share my ideas and experiences about how I introduce the classroom library to my students during the first few weeks of school. In case you missed it, you can click HERE to go back to the introduction to this series.